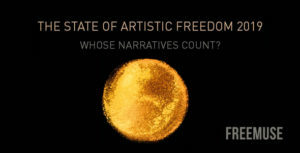 The State of Artistic Freedom 2019 report was launched on March 26 and informs about 673 cases of violations of artistic freedom that occurred in different cultural spheres in 80 countries throughout 2018. The 2018 report had 553 cases of artistic freedom violations in 78 countries. Growing: violating freedom of artistic expression by counter-terrorism legislation. 19 artist were imprisoned and 10 were detained under the guise of counter-terrorism. Freemuse’s research concludes that nine countries (Belarus, Egypt, Georgia, Israel, Nicaragua, Russia, Spain, Turkey and the United States) are found to have used anti-terrorism and ant-extremism legislation and measures against artists in 2018. The 29th annual report summarizes key human rights issues in more than 100 countries and territories worldwide, drawing on events from late 2017 through November 2018. The 674-page book reflects extensive investigative and advocacy work that Human Rights Watch staff undertook in 2018, usually in close partnership with human rights activists and groups in the country in question. All countries are listed separate, except collected listed United Arab Emirates and European Union. The report can be downloaded for free or searched by country at the website. On behalf of civil society organisations Freemuse Executive Director Srirak Plipat spoke to the 12th Intergovernmental Committee (IGC) of the 2005 Convention for the Protection and Promotion of the Diversity of Cultural Expressions at UNESCO headquarters in Paris on 11 December 2018. See above also the film that UNESCO published, based on interviews made in Norway, Senegal and Indonesia, which was presented during a public debate on artistic freedom during the IGC meeting. Prioritise the safety of artists and audiences, as attacks on artists and artistic freedom continue to rise. Urge state parties to use legal and policy measures to protect women, LGBTI and minority artists from attacks and violations of artistic freedom. Publicly recognise artists as human rights defenders and coordinate protection with existing international protection mechanisms. The first-of-its-kind, 100-page report has been launched on November 29 at the Danish Parliament in Copenhagen. The report highlights the inequality, exclusion and harassment of women artists and audiences around the world, as documented through five years of research. It is based on dozens of qualitative interviews and contains analysis of over 90 cases of violations against women artists and audiences. The Special Rapporteur in the field of cultural rights will be presenting her latest report to the UN General Assembly on Tuesday 23 October. 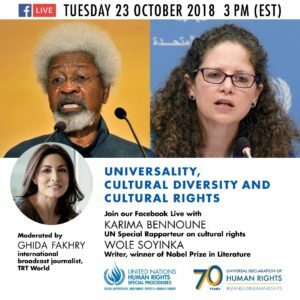 On occasion of 70th anniversary of the Universal Declaration of Human Rights Special Rapporteur Karima Bennoune and Nobel Prize Winner Wole Soyinka will talk on October 23 on relationship between the universality of human rights, cultural diversity and cultural rights. The event will be broadcasted live through Facebook on 23 October at 3 pm (Eastern time). The Martin Roth-Initiative protects artists who are committed in their home country to the freedom of art, democracy and human rights by enabling temporary residence in Germany or third countries for the purpose of protecting those who are being persecuted. Special significance is placed on the cultural scenes and local civil society in the host countries which, during the scholarship period, work with the scholarship holders, provide support and enable their professional development. Following a public appeal of leading figures of the German cultural scene who stated their willingness to accept responsibility and support their persecuted colleagues abroad, the Martin Roth-Initiative has been created as a joint project by ifa (Institut für Auslandsbeziehungen) and Goethe-Institut. Funded by the Federal Foreign Office of Germany the program promotes and supports endangered artists in close collaboration with a network of both national and international (cultural) institutions. The recipients of scholarships are selected by an independent Selection Committee consisting of members of the art and cultural scene in Germany as well as representatives from international civil-society institutions.